Sione Lauaki’s death has rocked the Tongan community with concerns mounting as he is the latest Pacific Island rugby player to be affected by kidney disease. Unlike Jonah Lomu, who died after suffering from a rare kidney disorder, Lauaki’s kidney failure issue was not widely known to many Tongans. Kaniva News reports his death Sunday at 35 came as a huge shock. Tongan All Blacks trialist and former ‘Ikaletahi chief coach Manakaetau ‘Otai said he was concerned that kidney failure problems appeared to have affected some Pacific Island players. ‘Otai said Lauaki’s rugby talent was marred by his sickness which was discovered while he was playing in France. He said Lomu and Lauaki were victims of the disease. Lomu’s kidney problem was widely publicised while he was with the All Blacks. Former All Black and Counties Manukau legend Joeli Vitiri was treated for kidney problems in 2015 and is currently receiving dialysis treatment. Vidiri had one of his kidneys transplanted in Auckland City Hospital in 2015. ‘Ikaletahi player Sione Vaiomo’unga was suffering from life-threatening kidney failure and was reportedly treated in Romania in 2015. Lauaki played 17 games with the All Blacks from 2005-2008 and scored three tries. He made his All Blacks debut against Fiji in 2005 and was part of the All Blacks team that went to France to contest the 2007 World Cup. His last game with the All Blacks was against Samoa in 2008. He played for several domestic teams including the Chiefs and the Waitemata Rugby Football and Sports Club. He racked up 70 caps for the team, having scored 14 tries during his Super Rugby career. Lauaki, who came to New Zealand from Tonga when he was eight, went to France and played for the ASM Clermont Auvergne in 2010 before moving to Aviron Bayonnais. It was while playing with Bayonnais that he was diagnosed with renal failure and cardiovascular problems, causing the club to sign him off for the rest of the season. He returned to New Zealand and played for club Waitemata again, as recently as 2014. Lauaki’s rugby career was a colourful one. Apart from being banned from the field several times for incidents including dangerous high and lifting tackles he had appeared in court several times. In 2006 he was offered police diversion after admitting assaulting a Hamilton security officer. In 2007 he underwent an anger management course after appearing in court for damaging an Auckland motel unit. However in 2005 his refusal to allow a Tongan criminal to hide behind his name showed he was a man with morality. A Tongan man Toma Lauaki appeared in court for a hammer attack on a truck driver. Toma fought to have his name suppressed, arguing he was a close blood relation of Lauaki and that revealing his name would affect his upcoming All Blacks games. But Lauaki went public and said he was not related to Toma. Lauaki’s death has been felt most deeply in his Tongan community. New Zealand–Tongan former rugby league and rugby union footballer Emosi Koloto, who represented the New Zealand Kiwis five times during 1991, remembered Lauaki. “We are deeply saddened at Lauaki’s death,” Koloto said. He said he tried to bring Tongan rugby players who played for the All Blacks to talk or help with their tournament and it was fortunate Lauaki was one of them. The three-times former Tongan World Cup rugby player for Japan, Viliami Sinalī Lātū, who is currently living in Japan said he bragged about how tough Lauaki was when he was in the All Blacks to his friends in Japan when they asked whether he was Tongan or Samoan. Lātū said Lauaki’s death was a huge loss to the rugby community. Athough he did not know him personally he was proud of him because he was one of the few Tongans who played for the world’s best rugby union team. Former ‘Ikaletahi captain and Chair of Tonga Rugby Union, Fe’ao Vunipola, said he regarded Lauaki as a “hero” in the field of rugby union. He said any loss of life in family, friends and rugby colleagues was poignant. He said he sympathised with Lauaki’s family and was praying for them. 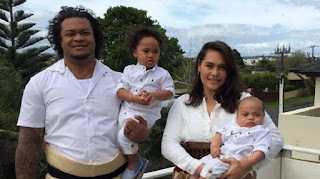 Lauaki is survived by wife Stephanie and two children. They had married in 2014 in Rarotonga, the place they had made home.